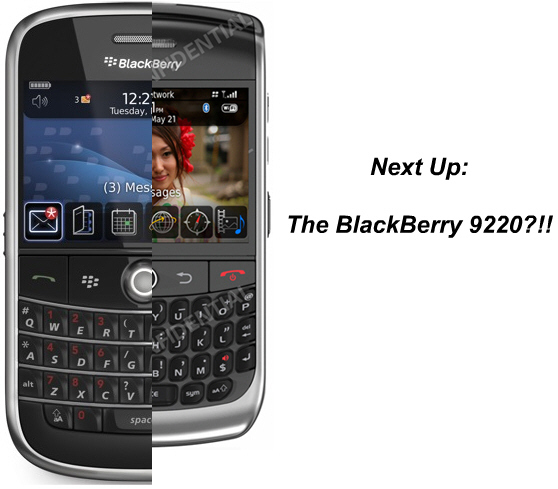 Next Up in the BlackBerry Pipeline... the 9220?!! As can be expected when a post like this is made without an accompanying photo or spec sheet, it can and will be met with a lot of questioning on its validity and source. Sometimes the info is wrong, sometimes it's really wrong, but sometimes it's Right! I'm throwing this blog post up because... well.. I think the info in this case is RIGHT (have now spoken to a trusty source who has confirmed laying eyes on official info surrounding it - working on getting more specs...but we're hearing it may have a touchscreen too!). So don't be surprised if when you see pics and more info on the BlackBerry 9220 (current device model) surface in the weeks and months ahead. No word on timeline, but it only makes sense. I wouldn't think for a second that RIM's pipeline is going to stop after the Bold, 8220, Javelin, Niagra and Thunder... the devices are only going to keep coming and they're only going to get better and BETTER! Exciting times, but dang... I just want the BlackBerry Bold to be released in North America already! !